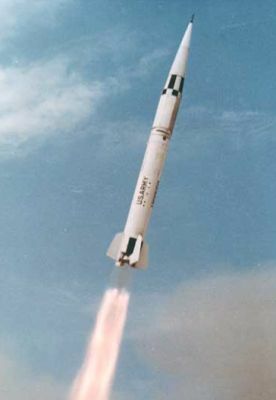 The Sergeant was the first solid-fuel surface-to-surface missile deployed by the U.S. Army, and replaced the MGM-5 Corporal as the Army's medium-range tactical ballistic missile. As early as 1948, JPL (Jet Propulsion Laboratory) and Thiokol studied new solid-propellant rocket designs for the U.S. Army under the name Sergeant, but this didn't produce an acceptable motor for tactical missile applications. However, solid-rocket development continued for General Electric's XSSM-A-13 Hermes A-2 project, and a new motor with an internal "Burning Star" design was tested in the RV-A-10 test vehicles. This was a core-burning solid-fueled rocket engine, in which the surface area of the burning fuel remained constant. Therefore this engine type combined the advantages of the earlier end-burning (constant thrust) and core-burning (light-weight structure, because fuel acted as insulator) rocket designs. In mid-1953 the RV-A-10 test program was completed, but the SSM-A-13 Hermes A-2 had been cancelled. At the same time, the Army requested proposals from several companies for the development of a new solid-rocket SSM, to be named Sergeant. The Sergeant tactical surface-to-surface missile program was finally officially started in January 1955 with JPL as prime contractor, and the designation SSM-A-27 was assigned to the missile. Some sources show a designation of SSM-A-26, but this is definitely incorrect. The SSM-A-27 designator was short-lived anyway, because the U.S. Army stopped to use this designation system in June 1955. The first experimental Sergeant missile was launched in 1956, and the Sperry Utah Company was chosen as primary subcontractor for missile production. In 1960, Sperry became prime contractor for the Sergeant, and in July 1962 the Sergeant was operationally deployed for the first time. By that time, the missile had received the designation Guided Missile, Artillery XM15, and quickly began to replace all MGM-5 Corporal missiles. Compared to the Corporal, the Sergeant was a much better operational missile. Its solid-fuel rocket motor was safer and more reliable than the Corporal's liqued-fueled one. The guidance method was also different. Instead of command guidance, the Sergeant used an AN/DJW-8 inertial guidance system by Sperry Gyroscope. This was more resistant to countermeasures and required much less ground equipment. Because the solid-rocket motor could not be shut off once ignited, range was controlled by drag-brakes, which were opened by the guidance system about halfway through the planned flight path. These drag-brakes neutralized engine thrust, causing the missile to follow a ballistic flight path back to the ground. A complete Sergeant system could be moved with significantly less effort than a Corporal system, and the first missile launch could be achieved less than an hour after the launch site had been reached (compared to 9 hours for Corporal). In 1963 the XM15 Sergeant missile was designated as XMGM-29A, which was soon changed to MGM-29A. In 1972 the new MGM-52 Lance missile began to replace the MGM-29A, and the last Sergeant was retired from U.S. Army service in May 1977. In German Army service, the Sergeant lasted two years longer, until it was also replaced by the Lance. 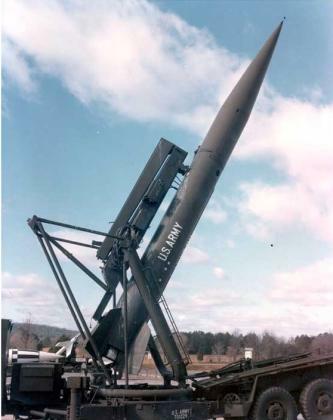 About 500 MGM-29 missiles were produced for the U.S. Army. Note: Data given by several sources show slight variations. Figures given below may therefore be inaccurate!